We reject the notion that grassroots initiatives are not scalable. Indeed, community-led interventions can transform systems of inequity by leveraging the latent capacity of vulnerable communities. Based on our evidence of impact, the Kenyan Ministry of Health invited Lwala to expand our model to the 1 million people in Migori County. To reach 1 million, we are taking a three-pronged approach of 1) direct service expansion, 2) peer replication, and 3) government adoption. Through research, advocacy, and technical assistance, we are leveraging this model county to influence the wider health system. 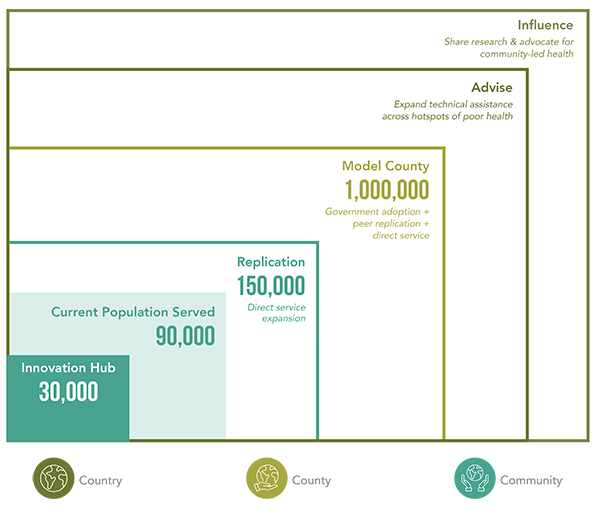 Lwala’s community-led solutions are uniquely positioned to transform health systems. Based on our evidence of impact, the Ministry of Health invited Lwala to expand our model to the 1 million people in Migori County, Kenya. Together, we are building a “county model” of community-led health, which will influence the wider health system. Constitutional changes in Kenya have devolved health services to county governments, making the county the relevant unit of scale. By driving health improvements in a county with some of the worst maternal and child health outcomes, we can position the model to change the wider health system. We are producing peer-reviewed research and building the global body of knowledge around community health. We can’t reach every community, but our research can. "The Ochieng’ brothers’ accomplishment in forming the Lwala Community Alliance is a well-known and inspiring example to everyone in the United States and abroad who is involved in global health."